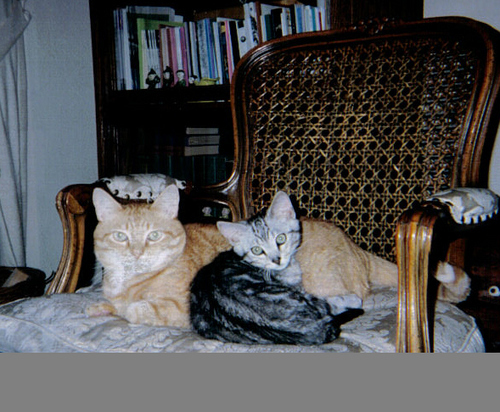 Peabody with Rupert as a kitten. They were so funny at these ages. Rupert would challenge Peabody to nightly wrestling matches, all very D.H. Lawrence, "Women In Love" homoeroticism -- and Peabody would watch him calmly, then pin him with one languid orange paw. *outraged kitten squeaks* Kittens grow, however, and Peabody had his comeuppance. It hasn't been the same since.